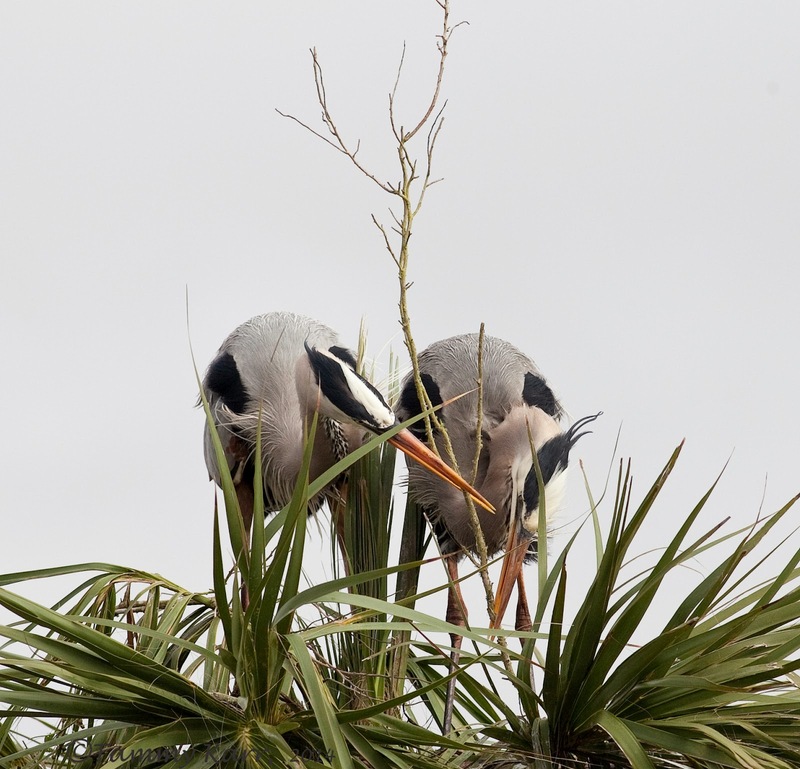 The Viera Wetlands is the place to be right now if you enjoy watching Great Blues carrying out mating rituals! 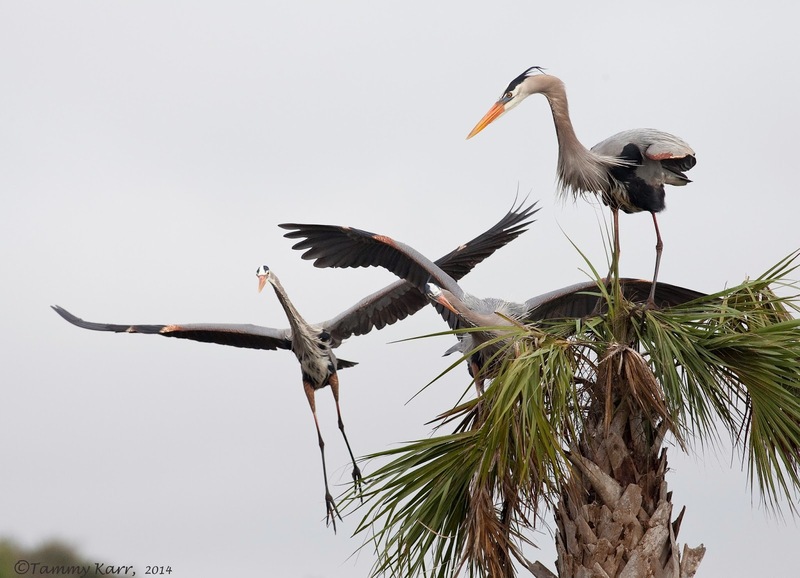 There are nests atop palms scattered throughout the wetlands. The most popular area has a cluster of 8 palms with four of them currently under construction with nests. The Great Blues come and go frequently. 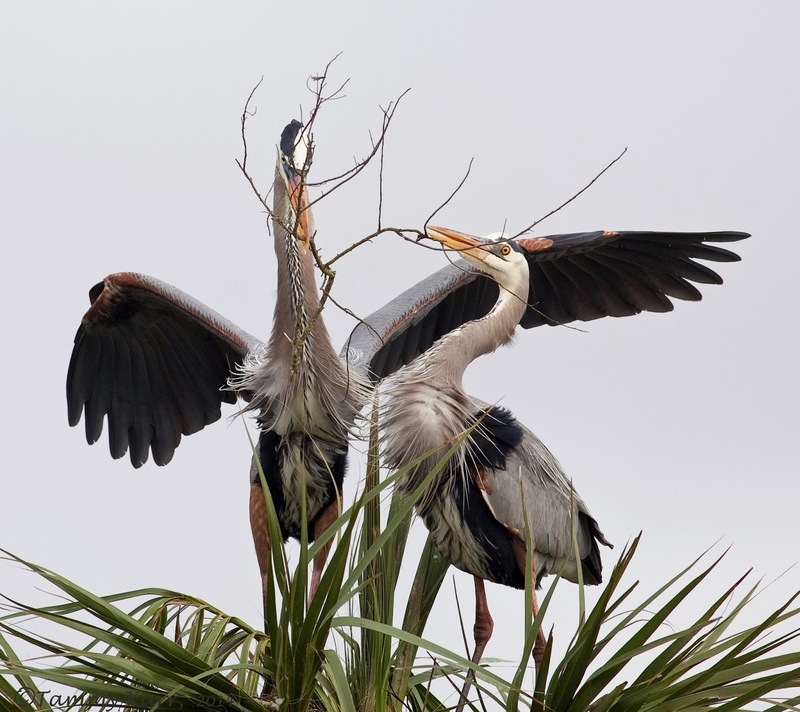 They take off to near by berms to search for just the right stick for their partner. Mates can be eagerly waiting for the arrival of a "gift", usually a stick or twig. 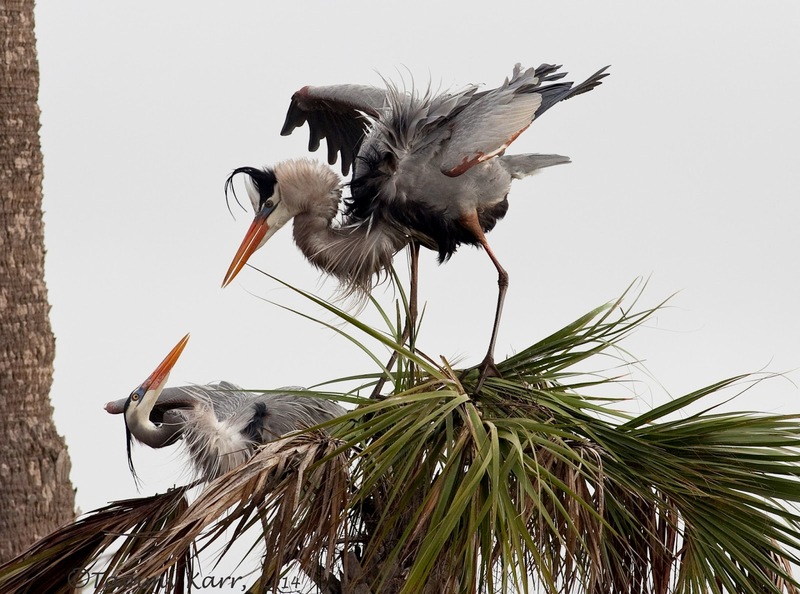 Some pairs seemed to be just adjusting to the awkwardness of sharing such close quarters with another heron. And for this pair, the bonding seemed to be off to a rough start. A nosy neighbor checks in on the squabbling pair. Some pairs already appear to be incubating eggs. With the incubation period being 25-30 days, maybe we will see some offspring soon! Your amazing photots are almost as good as being there! 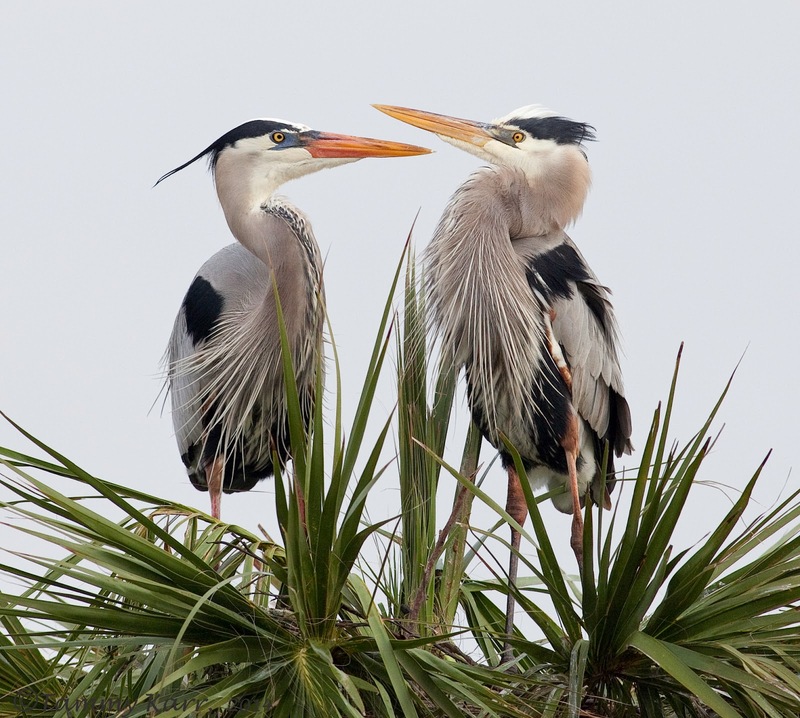 Wow, these are all just amazing capture of the GB Herons.. Wonderful series! Happy Sunday! 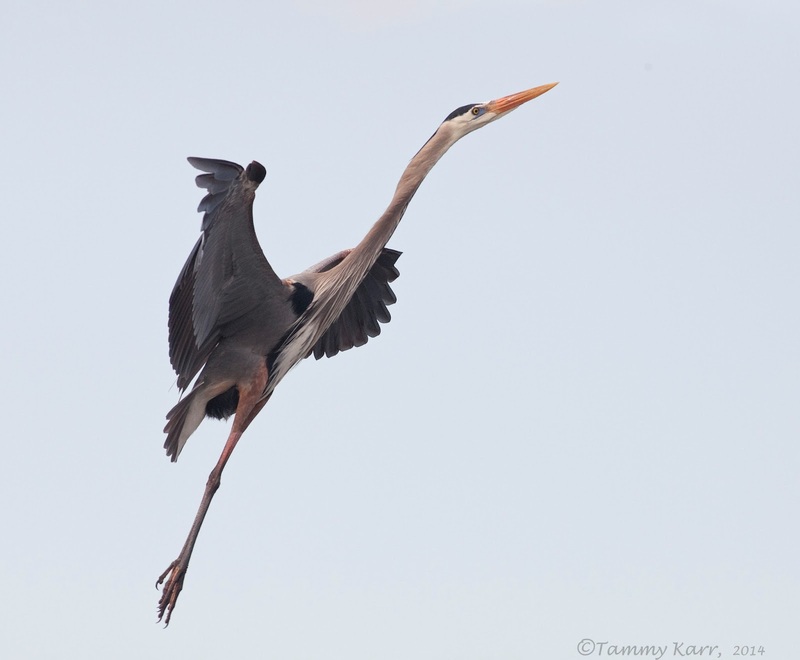 Tammy, these images are excellent, they are crisp and clear, they are very impressive! Wonderful shots Tammy, absolutely stunning. just awesome photos, as always! love the ballet leap to start with and the 'awkward' pair made me LOL! These images are excellent, Tammy. They are very impressive, stunning. Great set Tammy, nice to be able to follow the lives of these through your shots. Beautiful sharp photos again Tammy, I just love them. Mind I think the first two have seen one too many shuttle launches. Spectacular! We were there two weeks ago and saw some of the same behavior. Your images are just wonderful! Hi Tammy!!!.. Great pictures as always .. Best regards. That bird looks like an arrow shooting through the air! Cool! 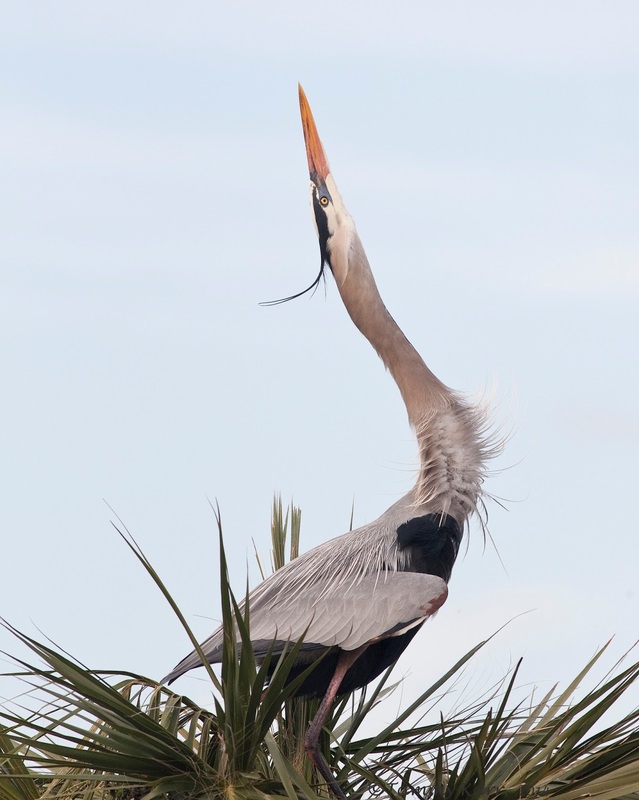 The Great blues are already in mating plumage and carrying out nest construction?? Isn't it early in the season? 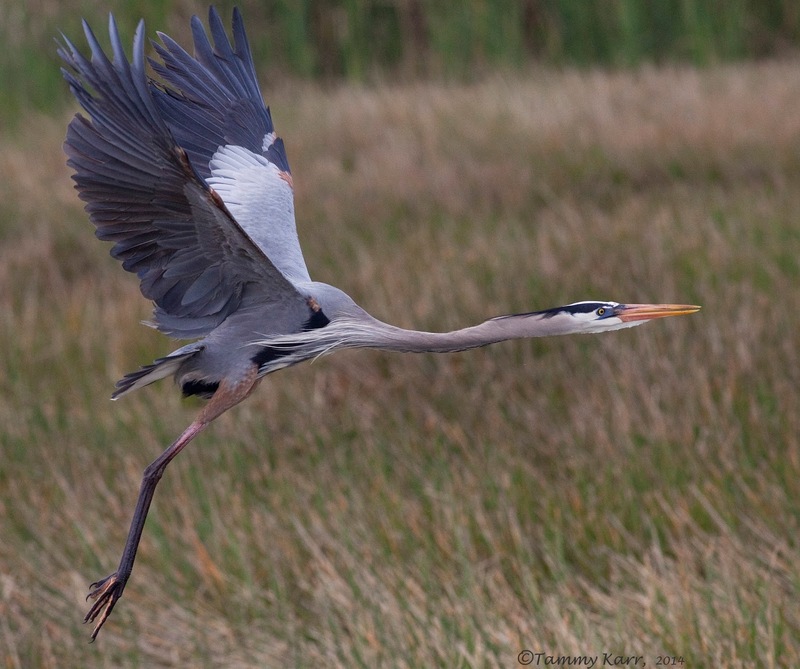 Enjoy the Viera Wetlands, such areas are precious for fauna for us, photographers! Hi Noushka, thank you for your comments! This is the typical nesting season for the Great Blues here. They actually begin pairing up in November. There are usually babies by the beginning of February. The weather has been so up and down here. Last week one day was in the 40s and another in the 80s! Take care! I need to pay more attention to these birds! It seems more actions when these birds in pair. Good work as always! Great behavior shots! So clear. 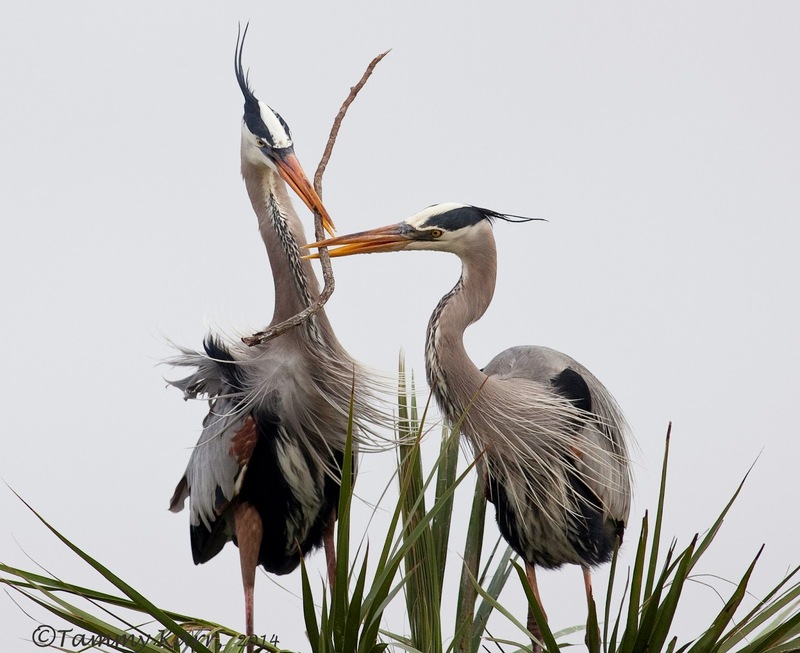 You did a great job telling the story of these guys mating. I'm expecting some good baby shots later. 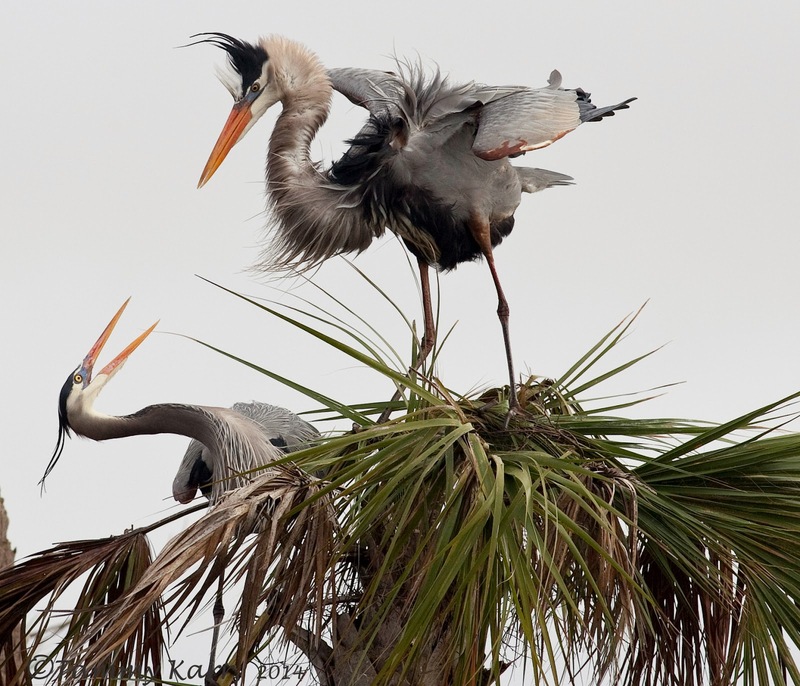 Tammy, not only are these excellent bird behavior images, but they are also so very stunning! I oohed and ahhed scrolling through this glorious post. 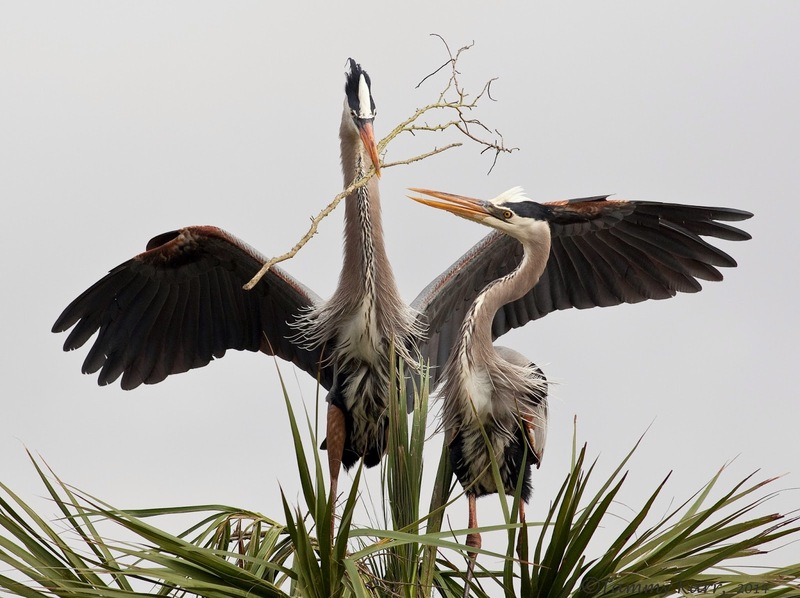 What a joy it must be for you to photograph these awesome herons ... and a pleasure for us to view your superb documentation. 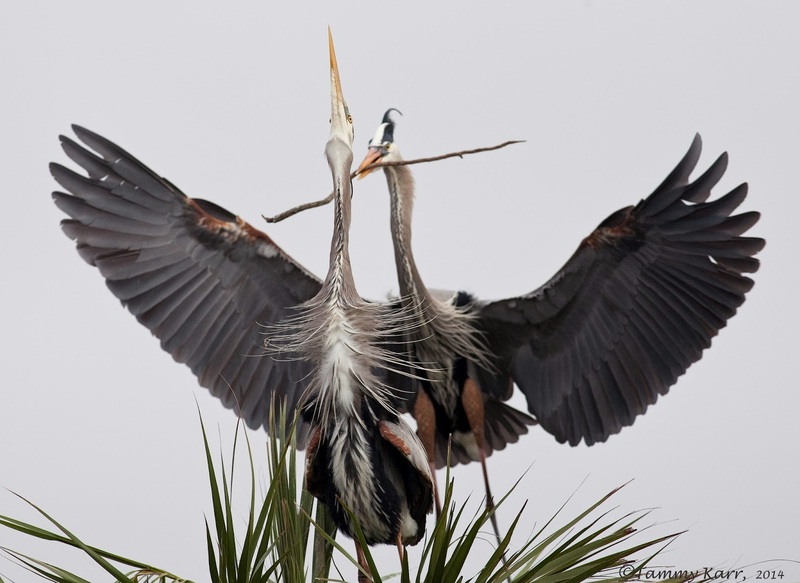 Superb photographs of the breeding behavior of Great Blue Herons, Tammy! We were there last month and really enjoyed watching their antics. I keep offering my wife a nice stick, but she just hits me with it. Maybe it's love?? These are the best Tammy! Frame #9 is to die for. You really got the best ones this year! They are breathtaking... thank you for taking me along! Un blog precioso Tammy..las fotografías son una maravilla, te felicito, y desde este momento me hago seguidor tuyo. Beautiful blog. Super pictures! Warm Greetings from the cold Warsaw. Have a look at the new photo album. Clear, sharp and beautiful kleruen fantastic.